"Come on honey, you can't let this get to you." Midnight Crossing has a setup that offers the promise of an exciting and tense thriller but a payoff that is laughable, to say the least. It is about piracy off the shores of Cuba, where treachery, love triangles, and generally bad script-writing run rampant. Saved by a group of actors who deliver nice performances in the face of ridiculousness, Midnight Crossing is not the worst film of this type ever made, but it certainly could have been one of the better. It begins off the coast of Cuba, where we see two young Navy officers performing a double-cross, involving murder, in an effort to recover a large amount of money. Knowing that they can not take the cash back to the base, they hide it and vow to return in the future to claim their fortune. When the time comes, a young couple (Laughlin, Cattrall) who have recently inherited a large sailboat, are approached by one of the sailors (Travanti) and his blind wife (Dunaway), who ask the young couple to charter them to the same location for their twentieth wedding anniversary. Soon everyone is involved in a quest for the money and it is unsure just what everyone knows. Everything is in place for Midnight Crossing to proclaim itself as a thriller with palpable tension, but ultimately the film feels flat. Within the first act, each character has been introduced and it is clear just what will happen. Is it any surprise that the inheriting of the boat from Laughlin's dead father has something to do with it, or that the Cattrall character has secrets to reveal? No, and with these problems the film falls far away from the promise that it once held. The film is also devoid of any style in its direction. The locations and genre offer up numerous possibilities in terms of camera movement and trickery, but instead director/writer Roger Holzberg shows no real eye and instead relies on absurd moments in the script to generate tension: the never ending parade of moments in which a character, originally thought dead, comes back to save the day. Once is fine, more than once is ineffective and lazy storytelling. The cast does a fine job, especially Dunaway, who seems to have wandered in from a better film. Her performance runs the gamut of emotions and is truly the best thing about the film. Travanti and Laughlin are passable in their roles, while Ned Beatty has a brief part that offers a little life. Image Transfer Review: Presented in a full-frame transfer, the image for Midnight Crossing looks great. Colors are bright and crisp with no bleeding evident; black levels show nice depth with no grain. This is a very nice transfer, free of any real flaws. Audio Transfer Review: The Dolby Surround track is basic in its construction as the center channel receives the greatest amount of attention. Dialogue is crisp and clear with no dropouts or distortion. This is a basic track to be sure, but it is well done. Extras Review: No extra features have been made available for this disc. 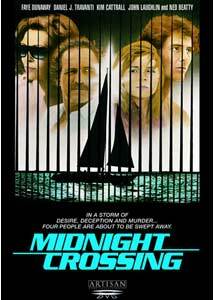 Midnight Crossing comes close to succeeding at being a nicely done thriller. Instead, it becomes a film that limps along until an inevitable conclusion.